While traveling on my eight hour, ground and air time, trip to Kremmling, Colorado this November, I realized that I would be content visiting with friends, breathing the fresh mountain air and simply spending time gathering thoughts for my goals and aspirations for the new upcoming year. Id had three previous successful hunts at the Sheep Horn Ranch and I didnt think my luck would run for four. Im a firm believer that one should have a passion for what they do in life both in work and play. This is one of my passions. I was introduced to the Sheep Horn Ranch via my best friend, Jeff Greene, aka Wood six years ago. His father, OG, has been hunting the ranch for several years with a group of his buddies and they had an extra spot and I was asked to join them. It makes for interesting camp fire talk with Auburn, Alabama and Tennessee fans gathered. And there are legends within the group including the 1958 national championship quarterback for the Auburn Tigers, Dr. Lloyd Nix and the legendary safety for the Alabama Crimson Tide national championship team, Murray Legg who also coached with the Bear. I was blessed with the opportunity to hunt with them for three trips and was invited this year by the forth season group from Tennessee, my birth state. With this group, you have Tennessee and Kentucky at odds. I will be the first to tell you that its a blessing to be able to go on a hunt of this nature. Many hunters spend a lifetime never having the opportunity to be a part of one of these hunts. I feel blessed to have the health, family support, friends and finances to participate in this hunt and certainly would never take the opportunity for granted. Its a hunt of a lifetime, every time. If youve hunted the West, you know some of the biggest differences about hunting the West verses the East, are the physical demands as well as the unpredictable weather. It can be very challenging traversing the terrain both hunting and harvesting the animals. With the combination of the high altitudes, severe temperatures and rouged terrain, the mind and body are challenged daily. That being said, I monitor both the NOAA and Weather Channel web sites months before going on the trip and litterly every three or four hours days before the trip to get an idea of what weather challenges we will be facing on the hunt and getting to the property. I also hit the gym with a concentration on the stair master and tread mill to prepare for the physical aspect of the hunt. There is one additional aspect of the hunt that makes one very aware and cognizant of their surroundings. That would be the mountain lions. Yes, the Sheep Horn has a few dominant male lions on the property and we are all very well aware of that. Three years ago, a hunter in the forth season witnessed a lion run down a cow elk from about three hundred yards away and proceeded to attack, drag down and mutilate the elk. Needless to say, they are always at the forefront of our minds while on the hunt. Five years ago, the owners son Ryan was stalking an elk in the dark timber when all the sudden he had a strange feeling over come him. The hair on his neck and arms stood straight up. He slowly turned around and thirty yards behind him was a lion, stalking him. He shot his gun in the air and the lion ran off. That was the last time he hunted the ranch. I have never sited one of the lions and quite frankly thats ok with me. Let them do their thing and lets just all get along. One of the things I love about hunting the west is the snow during the late hunting seasons. The scenery is breath taking, the air is fresh and the terrain is set up perfectly to monitor movement and track game. Unfortunately, this year, we didnt have snow on the ground and received very little while out there. 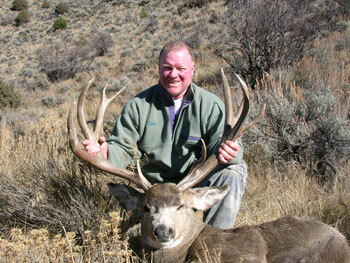 This would make the hunt more difficult as far as seeing game, especially elk. The elk harvest percentages were very low this year due to the weather. Generally speaking, the elk will stay high and in the dark timber with no snow on the ground. While tracking a mule deer through the dark timber this year, we noticed about a six inch, lush green grass cover and additional greenery and forage throughout the timber. The elk have no reason to move out to the lower elevations in that environment. Needless to say, our group saw very few elk on our trip although we all had elk and deer tags, six hunters total. The Sheep Horn Ranch is basically broken out into four general areas over about 5000 acres. The ranch has everything to offer the wildlife from three trout lakes, streams, water holes, dark timber, draws and hey fields in the bottoms. Its truly a paradise for the wildlife, owners and hunters. The property is surrounded by BLM property on two sides and two private ranches on the other two. Our groups generally hunt the lower lake region, the North West section, Garbage Dump road which is the middle upper section and the South road section. Generally, the elk are found in the North West section of the property. Ted Whitaker, the group leader of the forth hunting season, wanted to hunt the North West section the first day of the trip as well as Robert, Freddie and someone new to the trip, Walter. Doc wanted to hunt the lower lake section being that we saw two shooters there the day before opening day. Four hunters are about all you can hunt in the North West section. Because we were able to get out to the ranch two days prior to the hunt, we saw some patterns of the animals. The mule deer were working the lower half of the property. Also, my buddy Jeff indicated that he and his son saw a fairly nice deer off Garbage Dump road in season three. With everyone in place for opening day, I naturally decided to hunt the middle of the property off Garbage Dump road. Let me preface the name, Garbage Dump road, by saying thats simply a name of the section and nothing more. I dialed up my Night Force scope to 300 yards, peered through and there he was. I set up on a rock off draw number two that morning and watched five doe feed and bed down. I hunted to about 11:00 AM and never saw a buck. The deer never saw me either and I slowly worked my way out and back to the ranch. The two days prior to the hunt, we witnessed deer sparing and chasing so the rut was in full swing on our trip. The timing was right and the deer were in full rut so it was just a matter of time before someone had success. Four of the hunters came in for lunch and the other two hunters stayed in the woods for the day. Many say that Freddie has actually worn out a chair in the rock at the North West section. He likes that spot a lot and I guess that rock likes him as well. The temp in the afternoon was in the low 40s with little or no wind. I decided to head back out but this time I decided to go to the South section of the property. Its the most difficult part of the property to get to because its very steep and can be rather scary taking an ATV up. The road had recently been graded so I figured I would give it a shot. Once I got to the top of the middle section of the road, I decided to park the ATV by a bush and set up. The road goes up the middle of the south road which is between draws three and four. I set up by a lone tree which would give me an upper view of the third and forth draws. I didnt see any action in draw four however I did watch a nice four by four and doe work the third draw about five hundred yards away. I watched them for about two hours and decided to work my way down in the third draw about thirty yards and set up again. I found a rock in front of a nice sage bush which would cover my movement. I sat down, laid my equipment to the side and took a breath. I pulled up my binoculars, peered through and started to look over the terrain. On the lower part of the draw I saw a nice doe. In the corner of my binoculars, I saw horns, lots of horns. I immediately lowered my binoculars, set up my shooting sticks and placed my Browning 7 MM Mag Boss System gently on the sticks. I dialed up my Night Force scope to 300 yards, peered through and there he was. It was certainly bigger than anything Ive every shot and I was just as nervous as the first time I harvested a deer. The doe was very edgy and moving however the buck stopped for a moment to see what I was all about, big mistake. I took a deep breath and squeezed the trigger. My Browning has never failed me. There he lay, 300 yards away. 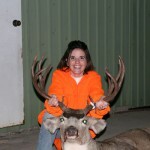 Wow, I couldnt believe that I had just harvested my largest deer ever and it was still the first day of the hunt. My luck ran for four and I would have been content never seeing him, its just that good out there. I started to walk down the draw to see the deer when I realized that the sun would soon be gone and I had a low light battery and I didnt bring a knife. I ran back up the draw and drove the ATV back to the lodge for help. Our hunters were still in the woods so I called Ham and he agreed to meet me at the bottom of the draw. Instead of driving up the South road, we walked up the draw. Wow, the deer was certainly very impressive. We field dressed it and decided because of night fall to retrieve the deer after the morning hunt. The next morning, five of us went back up the draw. Because of the weight of the animal and the location, we decided we would need to take it out in two sections. We got it done but I will say that its a very difficult challenge getting animals out of the draws. Its a lot of work and very physically demanding. Its especially difficult with elk. Our buddy Joe Lobello is the owner of American West Taxidermy in Kremmling and does a great job on our mounts and keeping us up to date with whats going on in the county. I just talked to him Friday and he gave me the numbers. 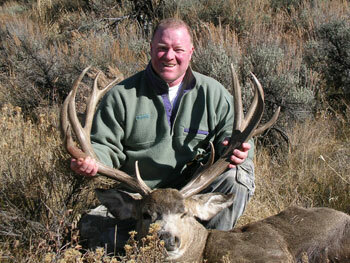 The deer weighed 307 lbs, has a 31 spread and scored a non typical 209. It was a 7X8. He told me its the largest deer he has taken in since being in business in Kremmling. I will have to patiently wait until this time next year to see his finished work. Joe indicated that many of the locals have dropped by to see the deer. Word spreads fast in a small town. Joe can be reached at 970-724-9321. Our group, the forth hunting group of the year and last group of the year, harvested four deer and a fifth deer was never found. After my harvest, I had the opportunity to hunt and scope deer for both Robert and Doc which to me is as fun as hunting by myself. Freddie, perched from the rock chair harvested a very nice deer himself. It was a very successful trip as far as mule deer go. We didnt have any success with the elk due to the weather. We were blessed to have some of the wives from the forth group with us and man can they cook, sing and make for good company. Im in the process now of gathering some great recipes. Hey, they even wanted a couple of mine as well. Although many have had great success on the trip to the Sheep Horn Ranch, there is something that keeps us coming back year after year with great anticipation besides the general hunting and visiting. 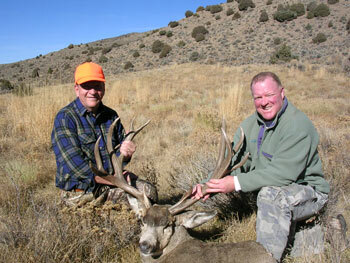 Both of the owners of the ranch, Hamilton and Kathy Duncan have named two deer on the ranch, Elk Horn. They claim the two deer are so large, they look like elk. Both Jeff and I can attest to this because three years ago, we saw one of the elk horn deer for about five seconds off of Garbage Dump road. We literally froze with our mouths open for that small moment in time. I dont think I got the elk horn mule deer but he makes for a nice cousin. We will be looking for his relative next year. The Sheep Horn Ranch is owned by Hamilton and Kathy Duncan. Not only do they have an excellent property for hunting but they have three of the best trout lakes in the state. They have always operated the property by referral only and have been full for hunting and fishing for some time. They are very gracious and humble and I view them as family. Its more like a family reunion than a hunt. They do not publish phone numbers and do not have a web site. I would like to thank the following manufactures and companies for their products and services I use. Browning, Nightforce Scopes, ScentLok, Real Tree, Leupold Binoculars, Under Armor Cold Gear, Redhead, Remington, Buckmasters and Rack magazine. Scott Stooksbury is a retirement specialist and money manger in Atlanta and owns Synergy Wealth Management, a Registered Investment Advisory firm.